Opened as Fauver Residence Hall in Fall 2005, the newly renamed Bennet Hall is home to 160 first-year students, all living in double-occupancy rooms. The building is air-conditioned and equipped with a community kitchen, a spacious central community lounge, as well as study and social lounges. Bennet is adjacent to Foss Hill and is in close proximity to dining facilities, Olin library, and other academic buildings. 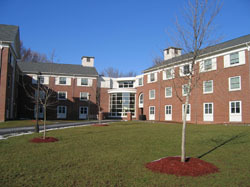 Bennet Hall is our University summer housing building and accommodates Wesleyan summer and Summer Session participants.